Paper Crafts by Candace: LOVE Simply Charmed!! OMG I love this cartridge!! This might become my new favorite. Just came in the mail yesterday and I had to make a couple cards with it. First Card- Hot Dog! I had a stamp that said Hot Dog so I knew that had to be my first cut. I love this little guy!! 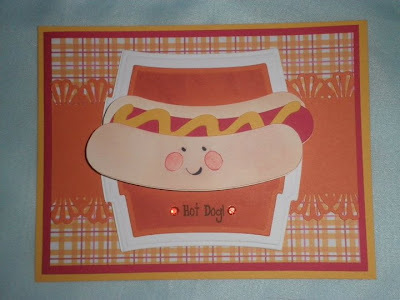 I used spellbinders for the background of the hot dog and my handy dandy Martha Stewart border punch on the orange cardstock. Second card, Miss Penguin. Or is it Mr Penguin? So I realized after I cut "Her" and put a bow in "Her" hair that lady penguins do not wear bow-ties. Oh well :) I put dew drops on her cheeks and in the middle of her bow-tie. I used my I-Rock for the gem in the middle of the flower. (LOVE I-Rock by the way). I also used my Martha Stewart border punch again! 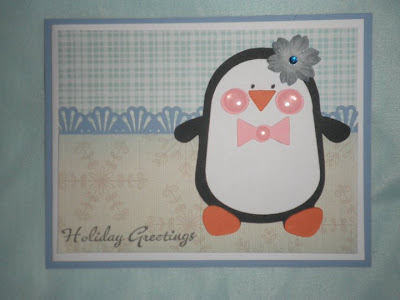 Very Cute cards, luv the penguin. love love love the cheeks !! !